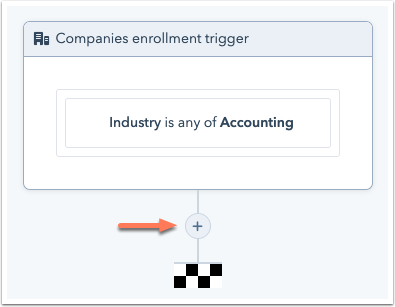 After creating your contact-based, company-based, deal-based, ticket-based, or quote-based workflow and setting your enrollment triggers, choose the actions for your workflow. Actions are functions that the workflow will execute for enrolled objects. Click the name of your workflow. Click the plus icon +. In the right panel, select the action to add to your workflow and set the details of the action. Actions under Workflow help with managing your enrolled contacts as they go through your workflow. Set the delay period in days, hours, and/or minutes. 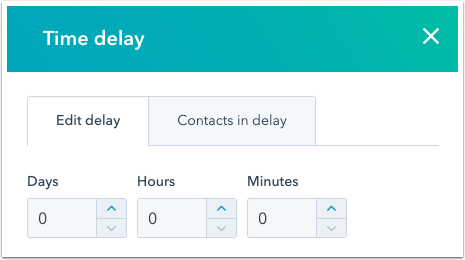 Please note: if you have a Center on a date or Center on a date property contact-based workflow, delays are relative to the selected date or date property instead. Learn how to schedule actions in a contact-based workflow to execute at a specific date and time. Direct enrolled objects down a certain path based on set conditions. Learn more on using branching logic in your workflows. In this example, if a company object has the Accounting value in their Industry property, it will go down the YES path. If not, it will go down the NO path. Enroll the object in the current workflow into another active workflow. 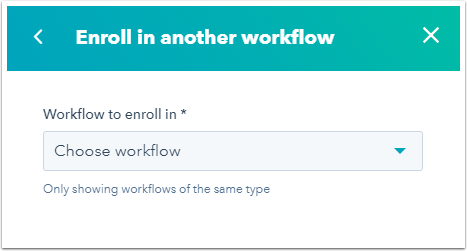 Please note: you can only enroll an object into a workflow of the same type (e.g., deals can only be enrolled into a deal-based workflow). Trigger a webhook to an external application. This allows your workflow to communicate with this external application. 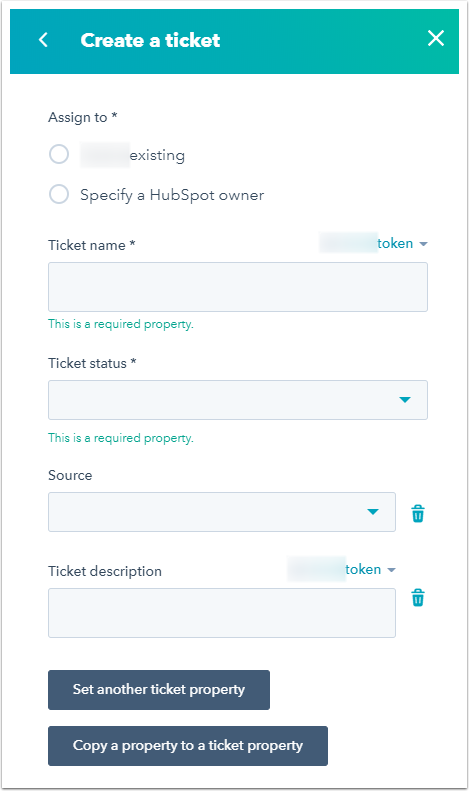 For example, webhooks can send a HubSpot company's information (formatted in JSON) to an external CRM. Learn more about triggering webhooks. Please note: this action is only available for Marketing Hub Enterprise, Sales Hub Enterprise and Service Hub Enterprise. These actions help with alerting your HubSpot users. In company-based, deal-based, ticket-based, or quote-based workflows, send an internal email to a specified email address(es) or to an email property, such as the Company owner email address. In contact-based workflows, send an automated email to specified email addresses, or a contact property that stores an email address, including any custom properties. 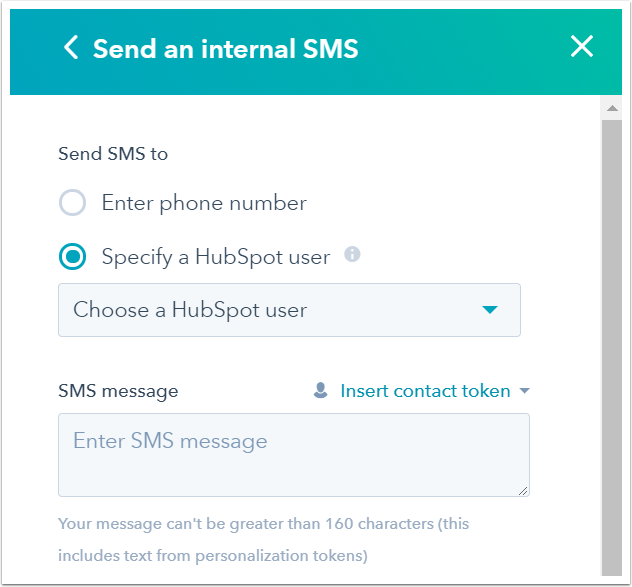 Send a text message to a HubSpot user or a specified number for an enrolled object. 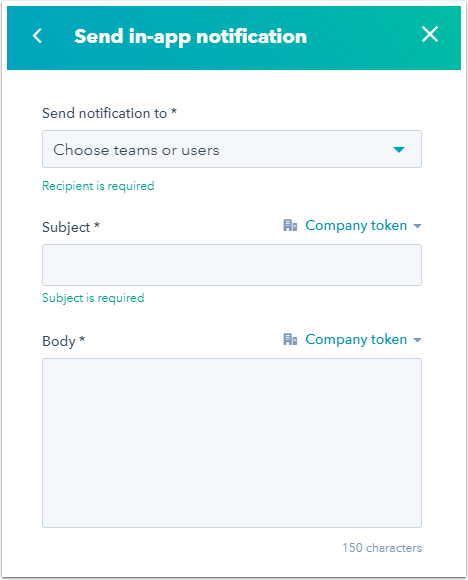 Send an in-app notification to specified teams or users. The notification will appear in the HubSpot notification center and sent to the HubSpot app as a notification. In a contact-based workflow, this action is known as Send notification. These actions help with alerting the contacts associated with the enrolled object. Send an automated marketing email to the contacts associated with the enrolled object. 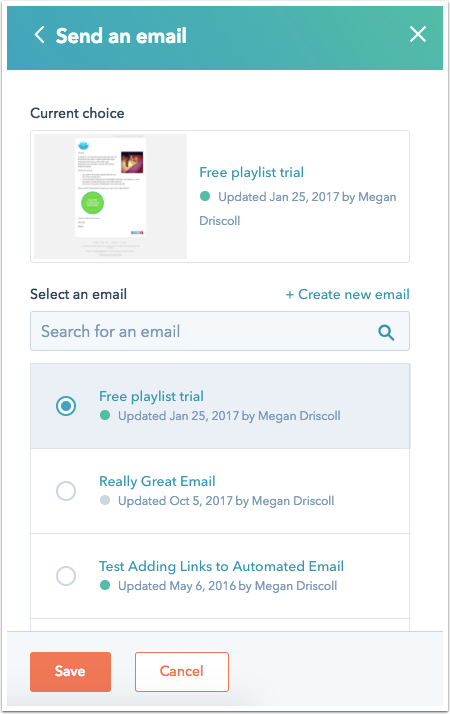 In company-based, deal-based, ticket-based, or quote-based workflows, you can click + Create new email to craft a simple automated email while staying in the workflows tool. In contact-based workflows, you can click + Create new email to create a new email in the email tool. 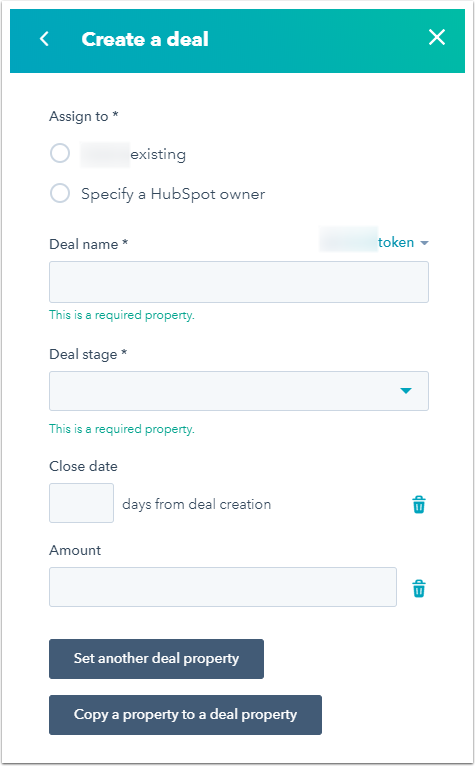 Actions under Integrations allow you to interact with external applications that are integrated with HubSpot. 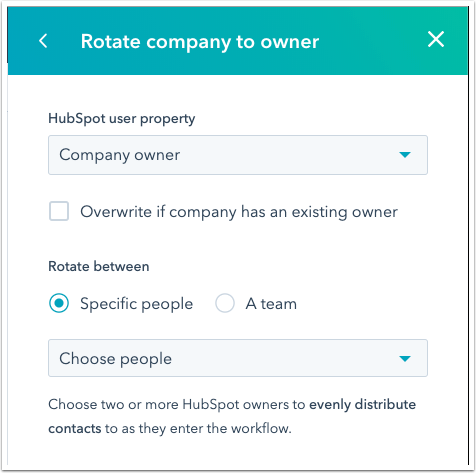 HubSpot supports certain integration actions such as sending a Slack notification, but it also allows integration partners to create other extension actions for use in the workflows tool that interact their application. An integration between the external application and HubSpot is built. The HubSpot account is integrated with the external application. Such extension actions are created. Where such actions are developed and supported by the integration partner, learn more about these actions through their documentation. 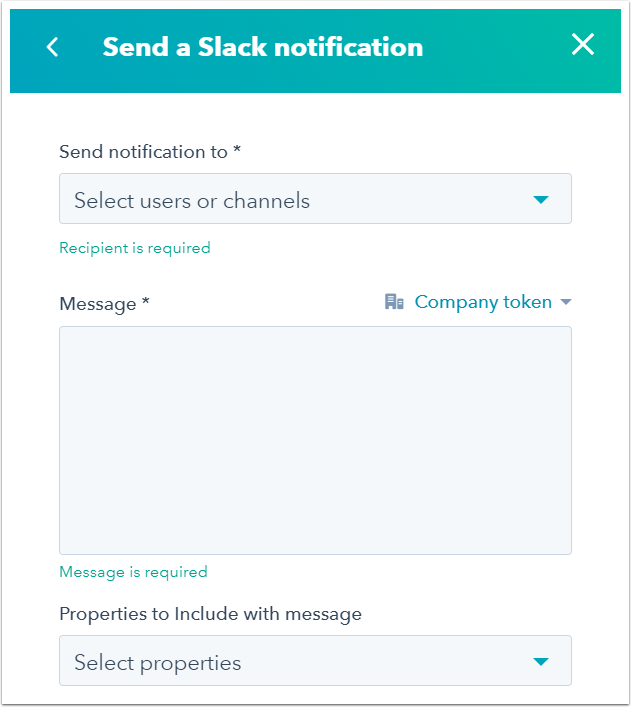 Send a Slack notification to your integrated Slack workspace when an object triggers the action. This action is supported by HubSpot. Assign the enrolled objects to users equally within a selected team or between specified users. This action is only compatible with paid users. In a contact-based workflow, this action is known as Rotate leads. These actions, when triggered, will create a new object and associate it to the enrolled object. Create a new deal when triggered by an enrolled object. Learn more about creating deals with workflows. Create a new ticket when triggered by an enrolled object. Create a new task when triggered by an enrolled object. These actions updates the properties of the enrolled object. Set a property value in the object itself, or set a property value in a specific property type. For example, you can select to update the associated contacts to the enrolled deal record. 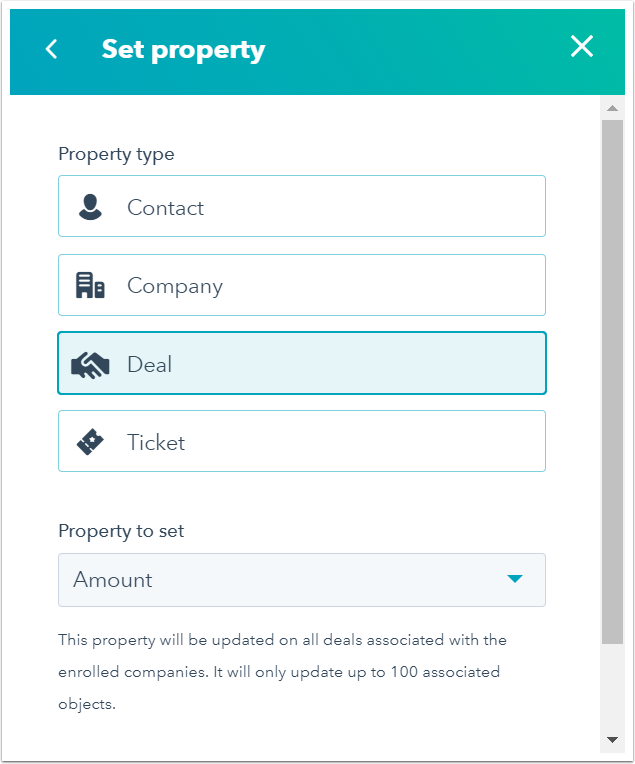 When selecting to set a property value of a different type (e.g., contacts when the workflow is deal-based), the action will update all associated records of that type. Copy a property value on the enrolled object to another property in the same object, or to a property in another object type. For example, you can copy the value in an enrolled company's Phone Number to a custom single-line text property in all associated deals. Learn more about compatible source and target properties for copying property values. 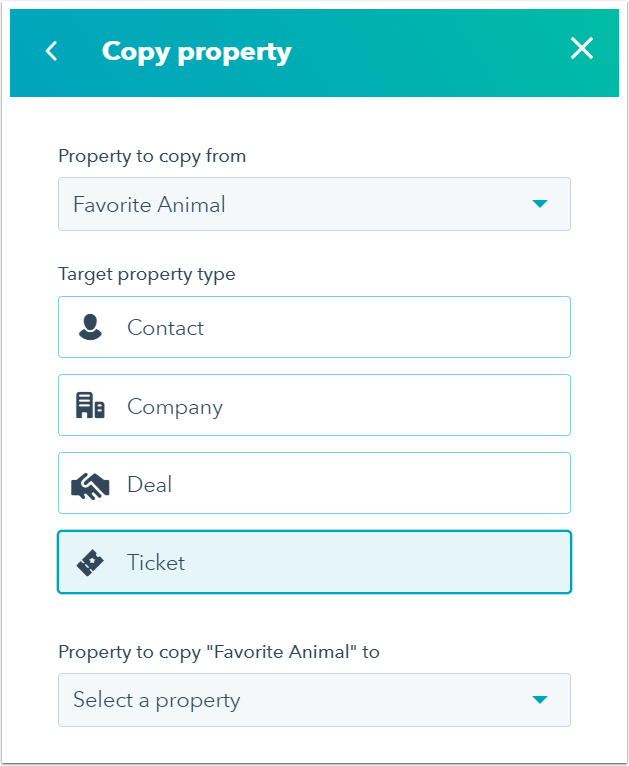 When you choose to copy a property to a target property on a different object type (e.g., in a company-based workflow, copying a company property to a deal property), it will copy the property to all associated records of that object type (e.g., the deal property will be updated on all deals associated with the enrolled company). Clear a value in a property. This can be a property in the enrolled object, or a property in another object type. For example, you can clear the value in the Lead Status property in all associated contacts to an enrolled deal. 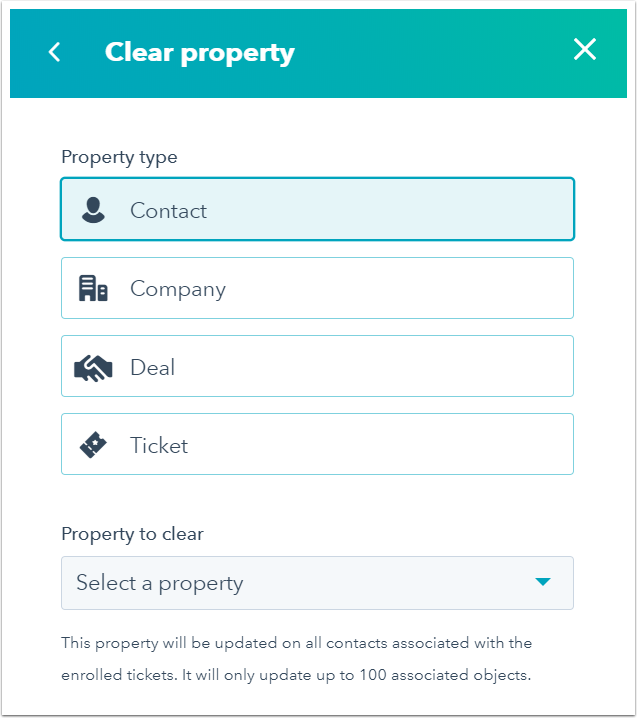 When selecting to clear a property value of a different type (e.g., contacts when the workflow is deal-based), the action will clear the property for all associated records of that type. Increase or decrease a value in a Number type property of the enrolled object. For example, you can increase the value of a custom number property, Orders bought, for every enrolled company. 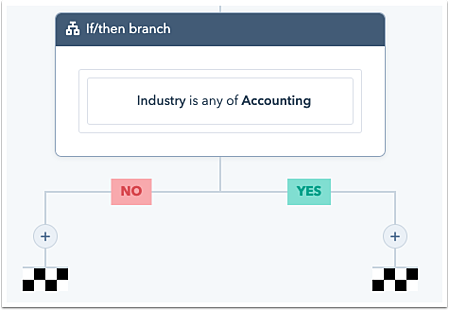 These actions are specific to contact-based workflows and are not available in company-based, deal-based, ticket-based, or quote-based workflows. 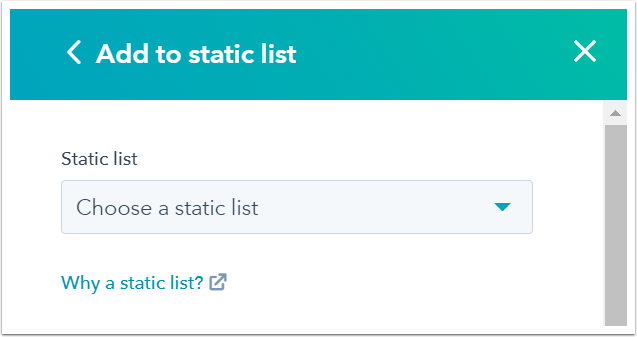 Add the enrolled contact to a specific static list. 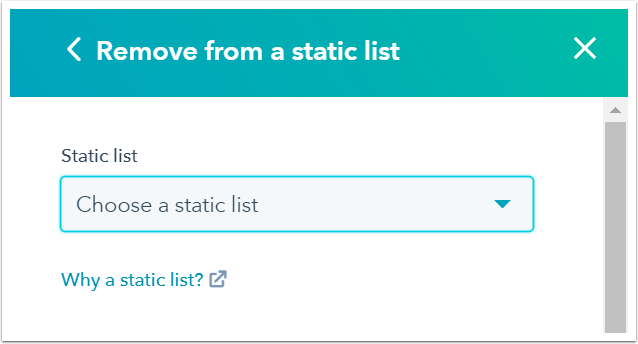 Remove the enrolled contact to a specific static list. Customize the subscription status of the enrolled contact. 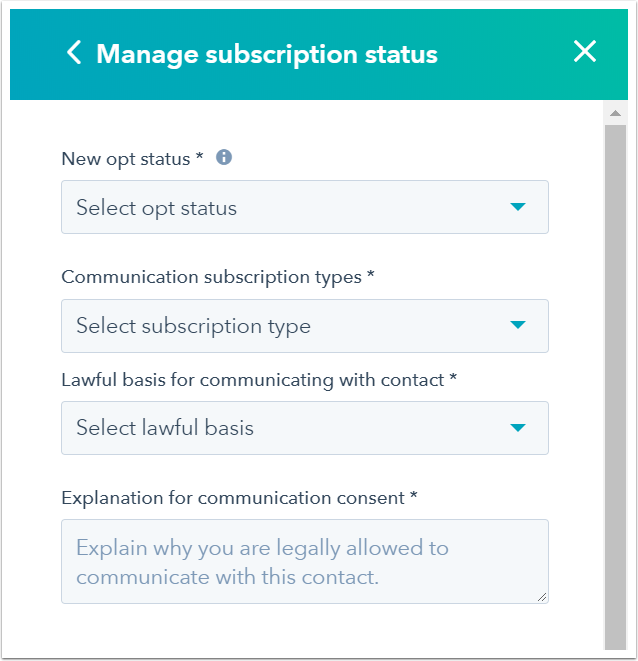 You can select their new opt status for a specific subscription type, the lawful basis for communicating with the contact and the explanation for this communication consent. Set a customized Salesforce task for the enrolled contact. 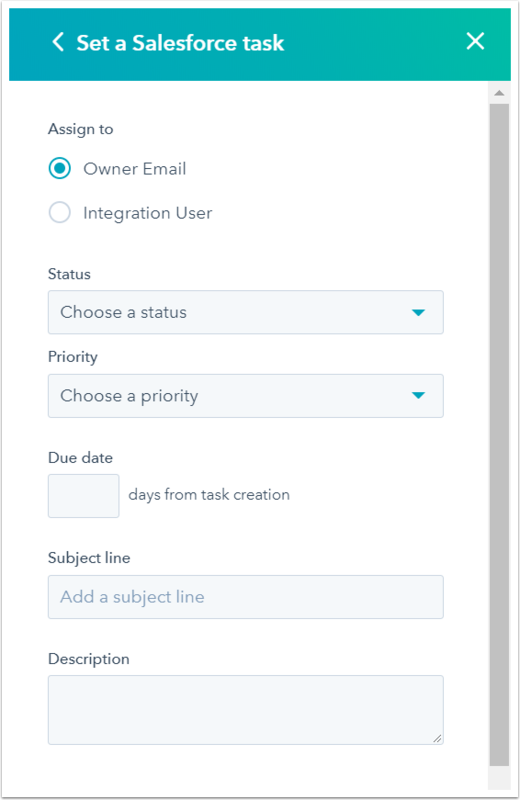 The contact owner or integration user will receive a task in Salesforce whenever a contact is assigned to them to and is enrolled in the workflow. 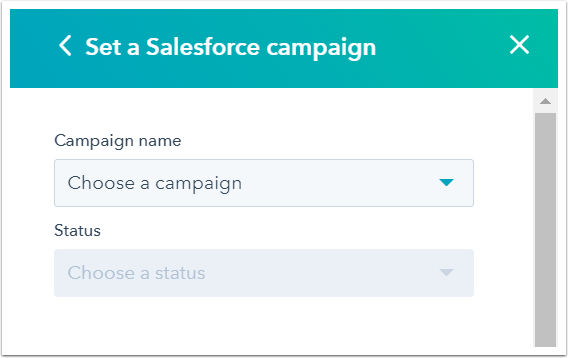 Set a Salesforce campaign for the enrolled contact. 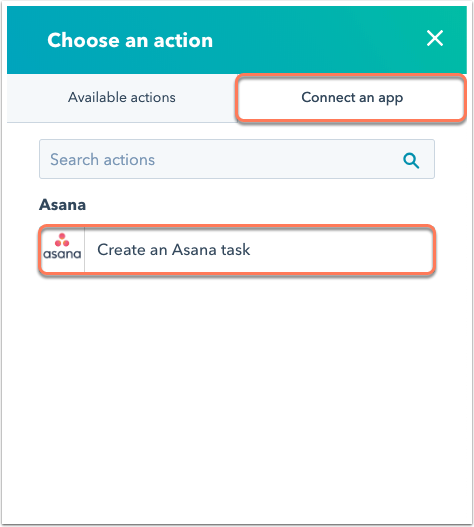 When adding an action, click the Connect an app tab to access the Create an Asana task action. 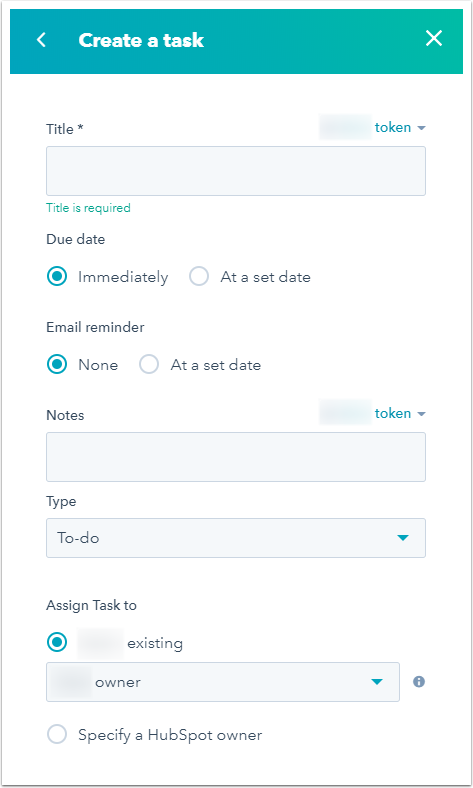 Learn more about creating Asana tasks through workflows.